First of all, I want to say kudos to RHBINVEST for bringing a powerful to the average investors like you and me. (because it is free for now? 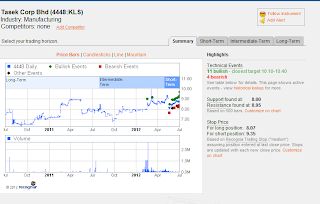 :D) So when RHBINVEST opened up the tool for free trial, I quickly signed up and have a run on it. 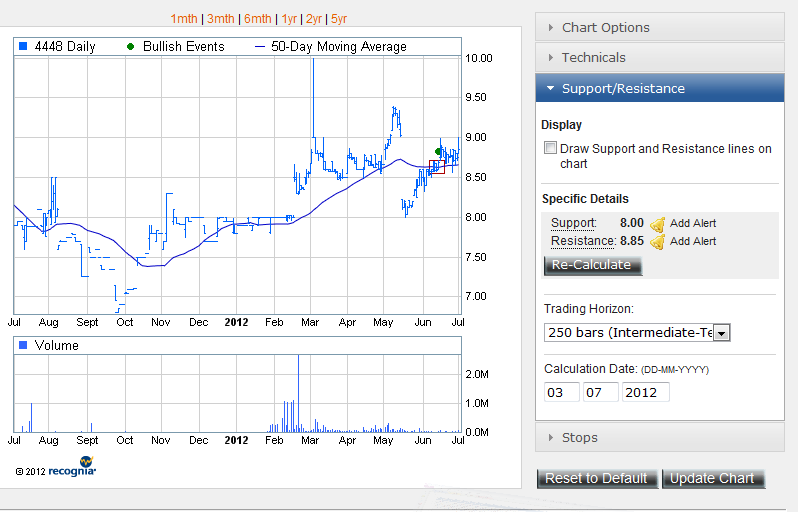 IT is FREE for RHBINVEST clients until 31st July 2012. After that, I am not sure how much it will cost to continue its usage. Nevertheless, I personally think this going to be a PREMIUM service as the RHBSCREENER is quite powerful. 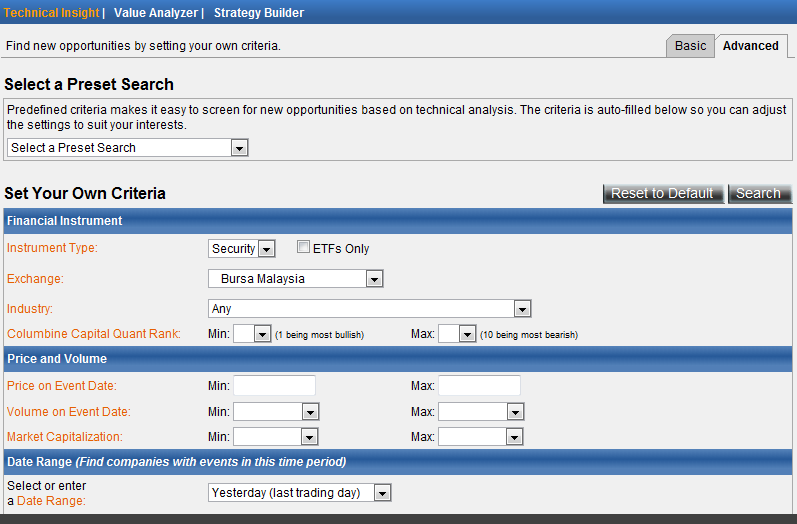 You can screen stocks in the following market: Malaysia, Singapore & USA. The 3rd powerful tool is the "Strategy Builder". 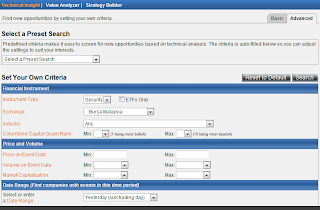 For the 1st part of this blog post, we will go thru the Technical Insight aspect of the screener. 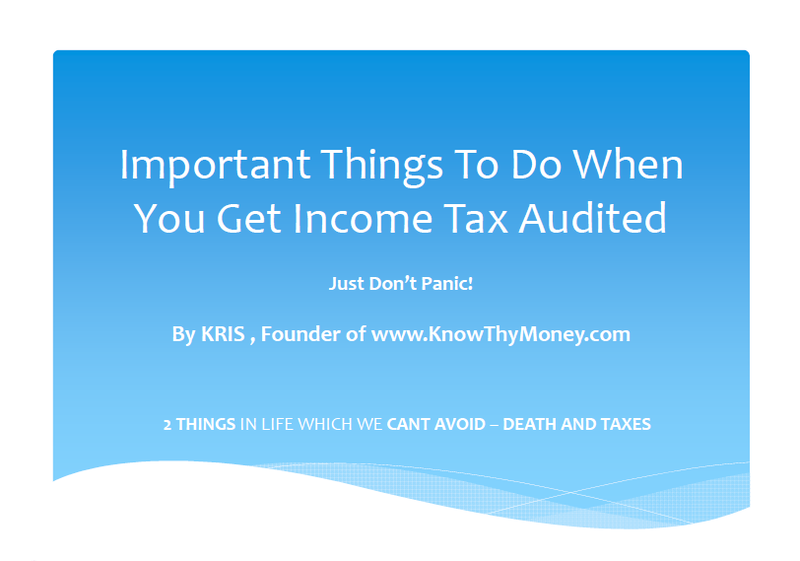 There is alot of things to cover hence the 3-part blog posts. P.S I am just sharing my experience with the tool, I doubt I can fully explain in detail or 100% correct all the nitty gritty features. Let the expert folks at RHBINVEST explain it to you in their seminars. 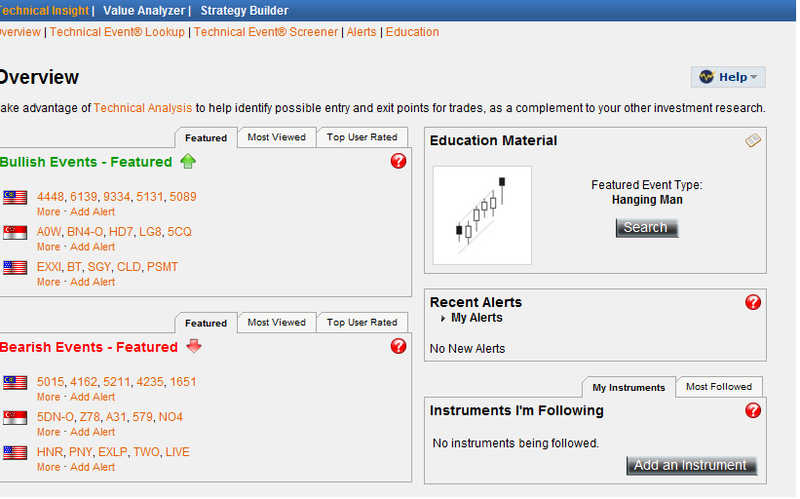 This is the initial screenshot that you will see in the Technical Insight tab. 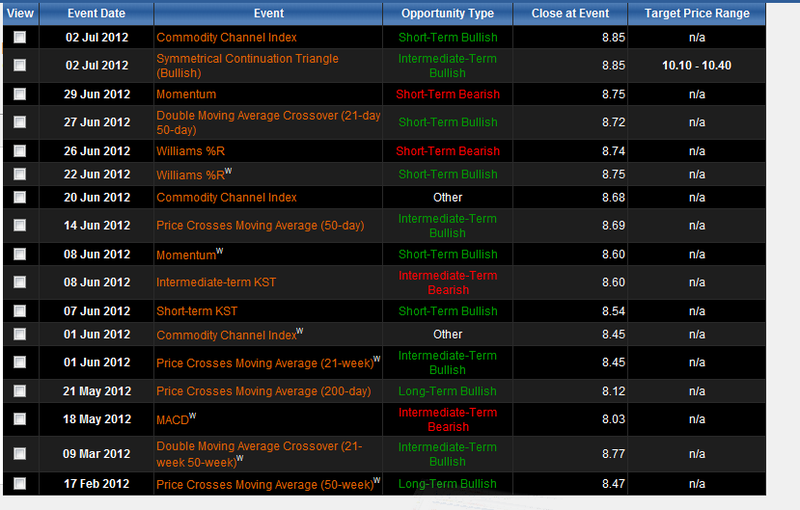 It is a summary to show which stocks are showing bullish or bearish technical signals. 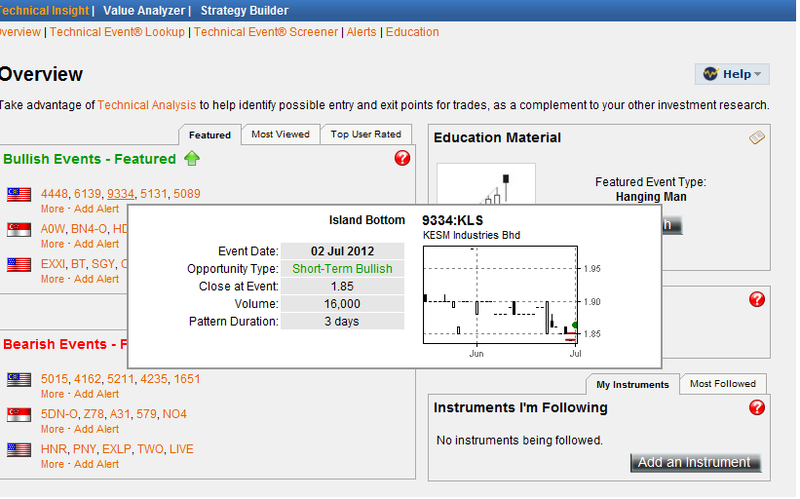 There is also an education tab for you to learn about technical patterns. 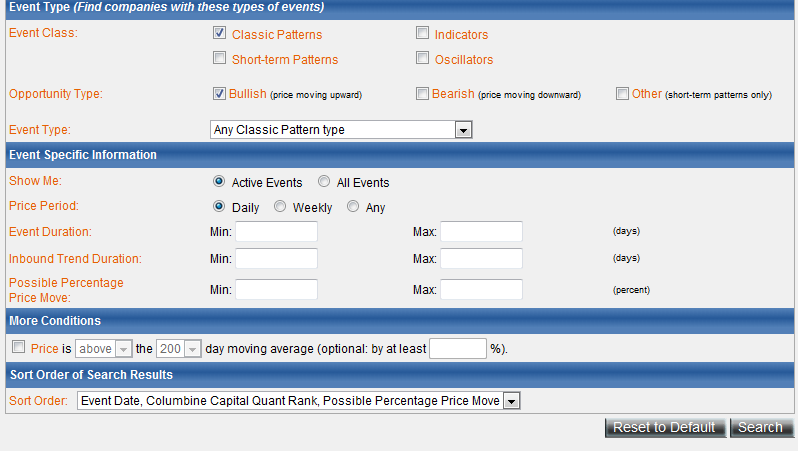 And you can set an email alert to be sent if your selected stock hit a certain technical pattern. 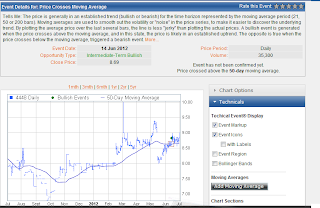 If you move your cursor over to the stock symbol, it will display its summarized chart information. Here is the one most powerful feature that you can employed in your stock pick. 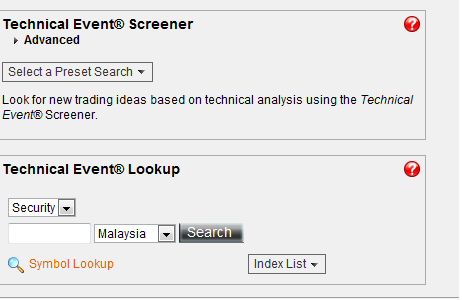 It is under "Technical Event Screener"
A detail breakdown of the "Technical Event Screener". Here I selected the "Advanced" tab just to show you the available options to play with. A continuation of the options under "Technical Event Screener". I had to print-screen it to another picture because there is a lot of selection criteria to tweak to your liking. This is the end product of the selection criterias that you picked earlier on. 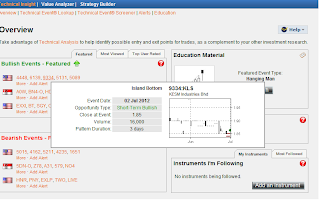 You can select to see the "Summary" or "Short term" or "Immediate Term" or "Long Term". 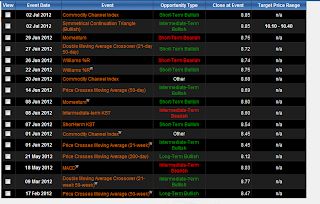 It can highlight the dates the technical signals occurred during these time frames as shown in the next screenshot. 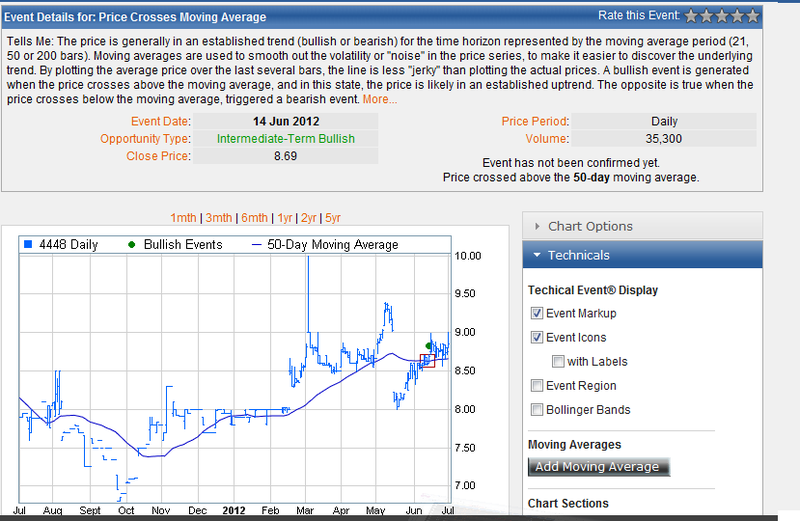 Here I pick the "Prices Crosses Moving Average (50 days)" which occurred on 14 June 2012 which is a bullish event. It can tell you the definition of the event if you are a newbie to Technical analysis, what is the price when the event is triggered and the volume. 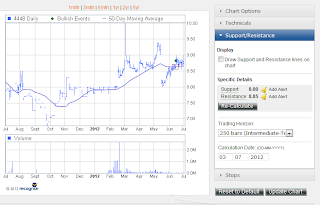 From there, you can select more detail information to be displayed on the chart. 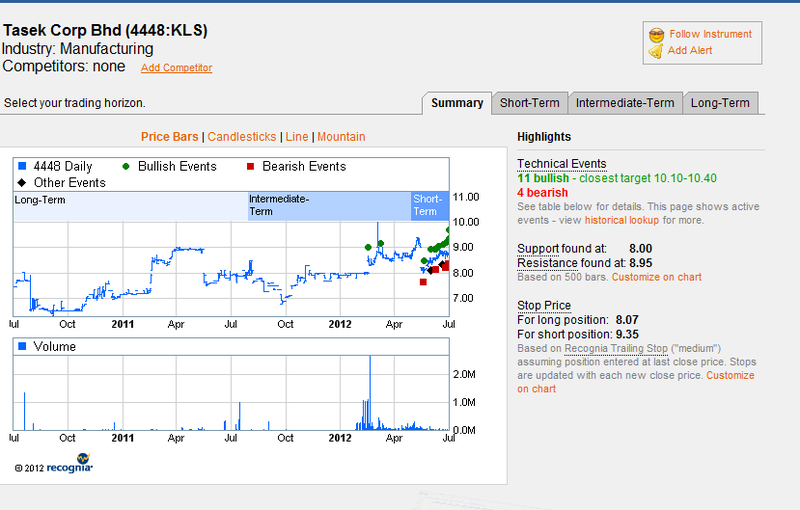 That's all folk for Technical Insight. 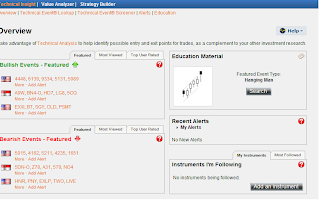 Stay tuned for Part 2: The Value Analyzer which is suitable for those that like to employ fundamental analysis in their stock picks.